Assassin's Creed, Rabbids and more headed to the App Store. It was bound to happen. After seeing the success numerous publishers have had on the App Store, Ubisoft finally threw its proverbial hat into the iOS arena, instead of simply handing its biggest licenses to Gameloft. The company had previously dipped its toes into the platform with the likes of Rabbids Go Phone, but from now on, expect to see a much bigger presence. To that we say, welcome to the party. Assassin's Creed Recollection features key art from the franchise. The highly successful publisher rolled out an ambitious initiative to bring its biggest brands to Apple's iPhone and iPad. In fact, the company has already begun to roll out downloadable games, including the recently released (and free) Assassin's Creed Rearmed, a multiplayer focused title that lets friends virtually slaughter each other. 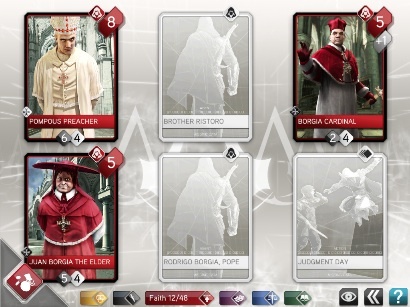 From there, the company will turn its attention to Assassin's Creed Recollection, a real time strategy effort that lets users uncover artwork from the series. Then, the popular Rabbids will receive more exposure, in such games as Rabbids Go HD and Rabbids Go Phone Again. 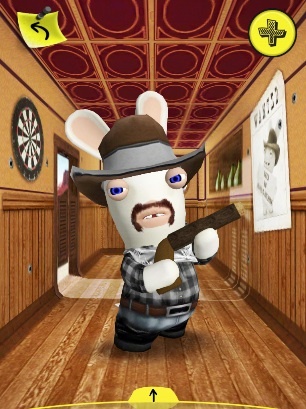 Those whacky Rabbids should find a home on the App Store. In addition, other Ubisoft properties will appear, million selling franchises like Tom Clancy's Ghost Recon, Michael Jackson the Experience and Prince of Persia, along with a new property called Monster Burner. "Continued advancements in mobile and tablet technology bring more and more gamers to these platforms," said Chris Early, vice president of digital publishing, Ubisoft. "We're excited to directly bring Ubisoft's well-known brands and quality games to these players." We couldn't agree more. This is great news. Let's hope this means tons of quality apps in the months ahead.